A Planning Application for the regeneration of the Regal and Shelz sites has been submitted to the Council. The application is for the provision of three 100 seat cinemas, a cafe, a restaurant and 34 flats (1 bed, 2 bed and 3 bed). Unlike previous issues of Highams Park News, this issue deals with a single issue because of the short notice of the for objections. The development site comprises the ‘Regal’ cinema, the Shelz restaurant (formerly the Country Grill) and an extra two floors above. The three cinemas, cafe a nd restaurant are on the ground floor or in the basement. Part of the ground floor and all of the four floors above are used for the flats. There is no provision for parking. This development is proving contentious. Some people are in favour of having the ‘Regal’ cinema site back in service but others consider the remainder of the development is too high a price to pay. Whilst the development of the Shulz site (the left hand blue block in the picture above) is designed to be in sympathy with the ‘Regal’, it is the extra two storeys on top that are definitely not (the top blue block in the picture above). These are clad in expanded metal mesh which is not in keeping with the ‘Regal’ or the surrounding housing. With these extra two storeys the building is five storeys high. Under ‘Application Id’ enter 173877 and click search. A summary will appear on the right hand side of the screen, Click on the heading ‘Planning Case – Received..’. You will see the documents submitted and you can comment on the proposal. If you wish to comment please do so but preferably before the published end date of 1st December 2017.
or write to Rob Bristow, Head of Development Management and Building Control, Town Hall, Forest Road E17 4JF. Quote Application Number 173877, 491-495 Hale End Road E4 9PT. Redevelopment of the Regal cinema. Give your name and address and the reasons for your objection. Parking is an issue which is not seriously addressed in the planning application. There will be about 60 people living in the flats and many will have cars. The surrounding network of residential roads cannot support this additional parking. Implementing a CPZ (Controlled Parking Zone) will not work as the Council will sell as many permits as it can. Witness the CPZ on the TESCOs site where the Council sold about 170 permits for about 70 places. The heavy construction vehicles will use Hale End Road and Larkshall Road to access and leave the site during the building phase. The submission does not state how long the construction phase is. As can be seen from the picture overleaf there is a Zebra crossing outside the site. Deliveries (and collections) will be from the kerbside in Hale End Road. This means that the Zebra crossing will be closed to pedestrians whilst deliveries are made and presumably a single file traffic system operated as both directions of traffic will have to use the north side of Hale End Road at the site. Deliveries to the site are to be before 7:30am and between 11am and 2pm. This means that the Zebra crossing could be closed when Highams Park School is having its lunch break. The parking spaces will be reduced in Beech Hall Road as the bays outside the Regal (at present used by shoppers) will be used for deliveries during the construction. Following construction these parking bays may be used to service the flats and for three disabled bays. On 21st August 2017 the architects held a public consultation at Hale End Library (Highams Park) from 4pm to 8pm. They showed the proposed ‘Regal’ development. The result of this consultation is part of the submission to the Council. Those in favour take up about 10 pages and lists the names of all those who signed. The many who had concerns or were against the proposal were dismissed in 6 lines of text. Their concerns were not properly addressed. There appears to be no requirement to provide affordable housing as part of this development! 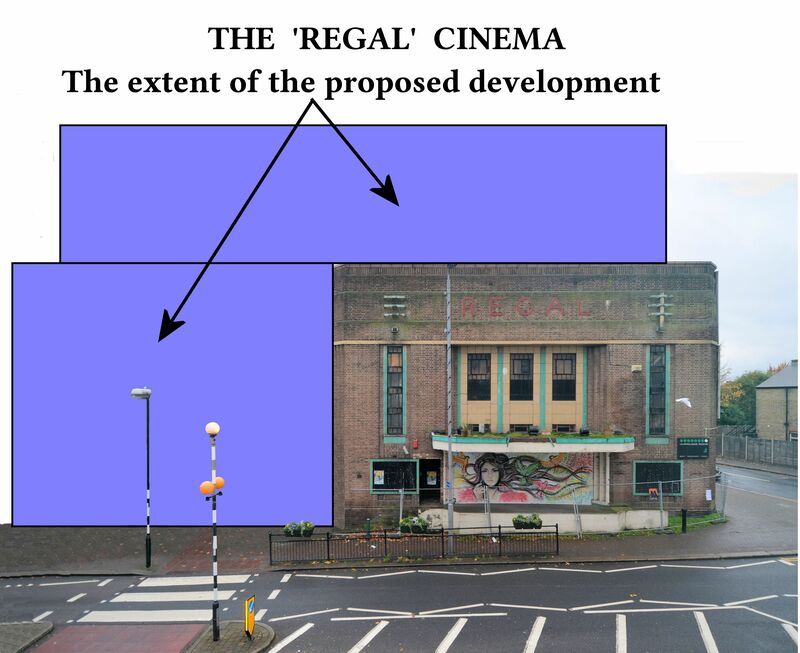 The development of the Regal cinema would be welcome. It has been a sad sight for too long. However the development proposed is too high and the two storeys on top are out of keeping with the (approximately) 100 year old housing stock which is Highams Park. The development of the old Shulz site (which for part of the Regal development) is sympathetic to the Regal site. Unfortunately, the two storeys above the Regal and Shulz are not. They look like an afterthought. One of the main problems in Highams Park is parking and this development only makes it worse. This building development is in the heart of Highams Park and very visible and therefore important to Highams Park.